Prince Irnskar is the Nord son of Jorunn the Skald-King, and nephew of Fildgor Orcthane. He is often found accompanying his father. 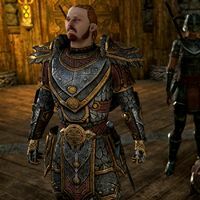 At first, Prince Irnskar seems prejudiced against the Dunmer and Argonians of the Ebonheart Pact - if spoken to, he will remark, "Why my father continues to cater to these ... foreigners ... baffles me." You can then ask "You don't support the alliance? ", to which Irnskar will say "I support the Nords. Let's leave it at that."